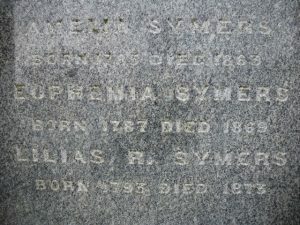 Lilias Symers, the youngest daughter and last surviving member of a large family of fifteen siblings, was a native of Alyth. Her father, Reverend Colin Symers, was Alyth's longest serving minister and, "for several years, the Father of the Presbytery." Little is known for certain of Lilias Symers’ life in Dundee, although some of its circumstances may be surmised or deduced. Lilias Symers was the twelfth of fifteen children born to Reverend Colin Symers (Minister of Alyth Parish) and his wife Helen Halliburton. 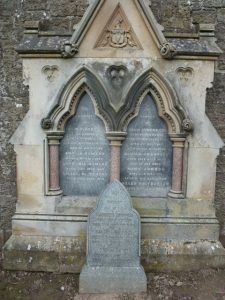 Her father was Alyth’s longest serving minister, who, at the time of his death in 1817, had served the parish for 43 years. It was said that his son in law, Rev. John Macpherson Cunningham, referred to him as ‘a little old gentleman in a tye wig’. Undoubtedly, Lilias’s formative years were shaped and influenced by the ‘life and work’ of the Church. She was part of a family, which for generations, (prior and succeeding), spawned ‘men of the cloth’. Her great grandfather (David Thomson) had been a minister in Meigle. Her grandfather (John Halliburton) was minister in Kettins parish. Her father, her brother, David (minister of Kettins parish) and her brother in law (John Macpherson Cunningham, minister of Newtyle, Meigle and Kinglassie parishes) were all also Churchmen. Lilias was brought up in the manse at Alyth. Her father wrote (1793) that ‘the Church at that time was an old Gothic structure. It has been frequently repaired and is in tolerable good order. The manse was lately repaired’. Lilias was a mere child, 5 years age, when her mother died in 1798. The ages of her siblings ranged at that point from 20 years to 6 months of age. It was probable that Lilias’s older sisters may have had a share of looking after and nurturing the younger, surviving siblings. However, access for Lilias to an education was assured within her parents’ marriage contract which – ‘binds and obliges him (Rev Colin Symers) to maintain and educate (any offspring) until they reach the age of 18 complete’. Needless to say, Rev Symers also received 6,000 merks Scots money in ‘tocher’ (dowry) at the time of marriage to Helen Halliburton. Lilias’ s life in the period after her mother’s death could be said to have undergone life’s ‘trials and tribulations’. In the first decade of the 19th century, Lilias’s oldest brother David was the first to leave the fold. 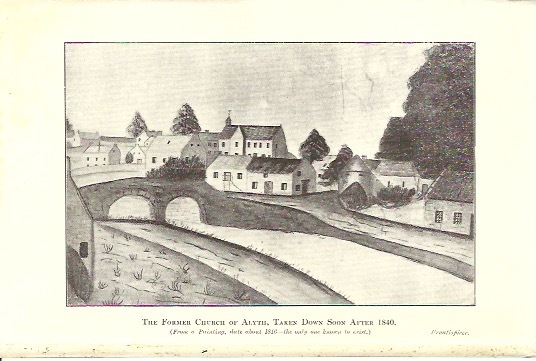 In 1801, at the age of 23 years, David was ordained as minister of Kettins parish, the previous incumbent having been his grandfather, John Halliburton. David held this post for 41 years until his death in 1842. Her older brother Colin removed to Dundee where he was involved with the British Linen Bank. By 1811, he had been appointed to the responsible office of ‘Collector of Customs at Dundee’. He held this post for 33 years when, in 1844, he retired through ill health. His death came in 1860. The next hurdle endured, also in 1811, was the death of Lilias’s older brother James, aged 20 years. By 1816, her oldest sister Margaret had married Reverend John Macpherson Cunningham and had moved to Kinglassie in Fife. 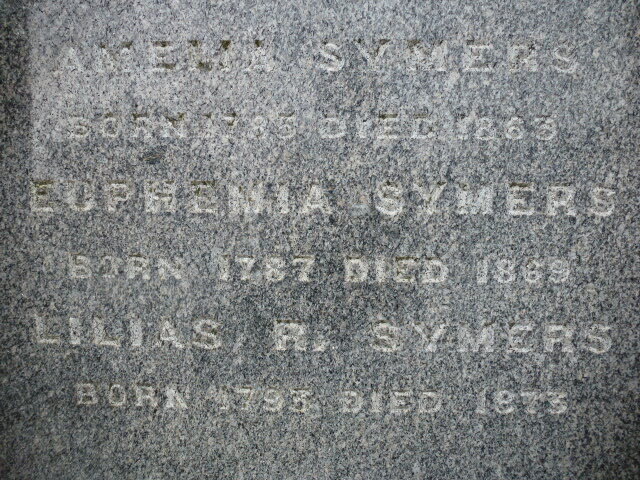 Her brothers John Symers and George Symers also left their Alyth home to forge their futures in Dundee. There remained the six sisters – Elizabeth, Helen, Amelia, Euphemia, Mary and Lilias herself, who, perhaps, lived on in Alyth until the death of their father in 1817. Certainly, there is no mention of them in Dundee until the later 1830s. Unfortunately, the listing in the Postal Directory merely lists ‘Symers, Misses, 107 Nethergate’ – giving little clarity as to which of the sisters the entry includes. What is more certain is the fact that the spinster sisters remained closely linked with each other, some living together or in close proximity and also, the six being grouped together in various financial ventures. As early as 1827, the six were equally granted a bond of of £2000 by George, Earl of Aboyne (then Marquis of Huntly). There is evidence of further promissory notes, bonds, accounts and heritable subjects held equally among the sisters. It becomes clearer too with census entries that older sister Elizabeth lived with older brother Colin until her death in 1852. Euphemia, at times, resided with them at Nethergate House, 158 Nethergate, for some years. Sister Helen had died in 1837 and so, it seems likely that ‘the Misses Symers’ of this period referred to Amelia, Mary and Lilias herself. Mary’s death in 1858 and Amelia’s in 1863, left the last of the ‘spinster’ sisters (only sister Margaret married) to be Euphemia and Lilias. Lilias had made her home with her sisters at Whiteleys, 147 Nethergate. After their brother Colin’s death in 1860, Euphemia had joined Amelia and Lilias at Whiteleys. Theirs was the Easternmost of the four villas, bordering Park Place and fronting onto the Nethergate. However, it was put up for sale in 1861 – ‘that villa occupied and possessed by Misses Symers’. By 1863 when Amelia’s death is recorded, both Lilias and her remaining sister Euphemia were in their 70s and had returned to 158 Nethergate (owned and occupied previously by their brother Colin). Perhaps the tables had turned. Lilias, who had perhaps been looked after and protected by Euphemia in her younger years after the death of their mother, was now assuming that role for her older sister, whose life came to a close in 1869. The ‘Misses Symers’ continued to live a quiet, modest life for the remainder of their days, contributing also a quiet benevolence to various causes. Perhaps some of these causes had been influenced by their younger brother John, whose many charitable ventures were well documented. At her death, Lilias left an estate valued at over £27,000. The Symers’ early years in Alyth would appear to have been worthy of remembrance. To that end, Lilias’s niece, Helen Halliburton Symers, gifted a stained glass window to the new Alyth parish church in 1905. Surrounded as she had been by the closeness, love, faith and support of her large family, it could be surmised that Lilias held Christian tenets deep in her character and would have spent her life in a manner as would befit one imbued with the teachings of the Gospel. The information above about Lilias Ramsay Symers has been collated from a range of digital and hard copy sources. To the best of our knowledge it is correct but if you are relying on any information from our website for the purpose of your own research we would advise you to follow up the sources to your own satisfaction. If you are aware of an inaccuracy in our text please do not hesitate to notify us through our Contact page.